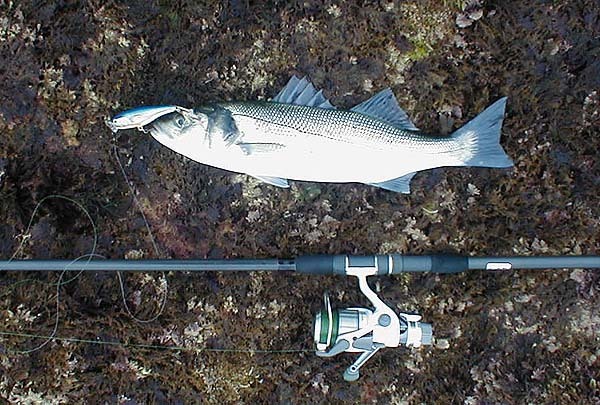 Recently, on the tactics page, I mentioned that it was often possible to successfully fish different states of the tide by choosing your spots. As an example I mentioned one ledge which has only been producing bass at slack low water. The point was emphasised on a recent trip with a pal, Brian Baxter. Brian has corresponded with me by e-mail and last week he contacted me and said that he was going to try an early morning session at the ledge in question. We met (for the first time) at four thirty (a.m.) as we parked our cars and walked along the shore to the chosen fishing place. There is only room for a couple of anglers and when we arrived the tide was still running out hard. Brian tried a surface lure and I fished a shallow diver but for an hour or more neither of us had a touch. Since changing my reel the other week I've had a few problems with the Whiplash (smaller spool? different line lay?) and I spent a bit of time fiddling with the line to avoid tangles. Anyway, as it approached low water, I commented to Brian that on my last few sessions the fish had been biting as the tide slackened. By then I'd switched to a Skitterpop but Brian had stuck to his slim Duel Magnet slider. 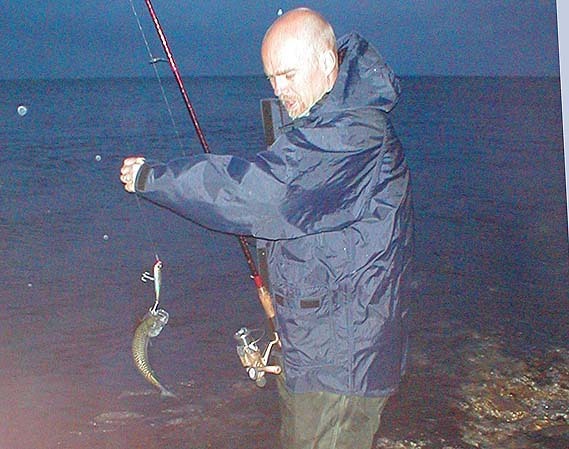 The tide was still running a bit when Brian had a splashy strike on his lure and hooked a smallish fish. As it came closer we saw that it was a mackerel. He said that he had caught quite a few mackerel on surface poppers but - having never seen this before myself - I was very interested. 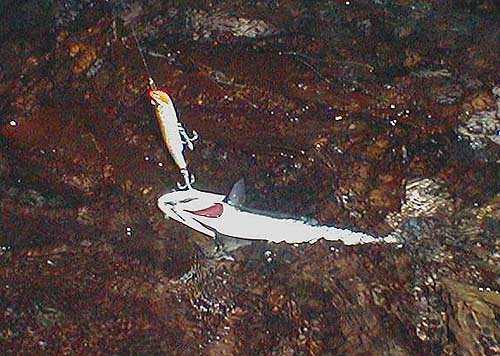 Brian's lure was slim, had silvery hooks with no dressing and the mackerel was well hooked on the tail treble. By the time we had returned the mackerel the tide was turning and within a few minutes I had a strike which was not hooked. Five more minutes and a second fish had a go at my lure, it missed the first time but at its second attempt (next chug) the line went tight and I was in. I landed the bass after a short struggle, took a picture, unhooked it, returned it and after a few more casts repeated the process almost exactly - even to the miss on the first bite. 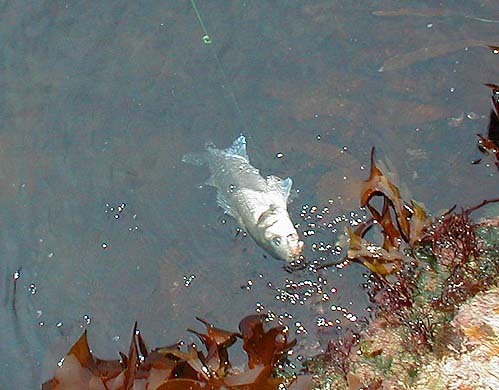 By the time I put my second fish back the tide was just beginning to flow and it was time for me to go. Brian hung on after I left for half-an-hour but tells me he had no more bites. Fascinating! We both enjoyed our trip and agreed that we had learned quite a bit - you can't expect more from a trip than that. We will certainly be fishing together again in the next week or two and if we keep on learning in the same way it can only be good for us both.